Chip Lord’s Miami Beach Elegy was presented by the artist at a screening at the Rena Bransten Gallery in San Francisco on May 13, 2017. 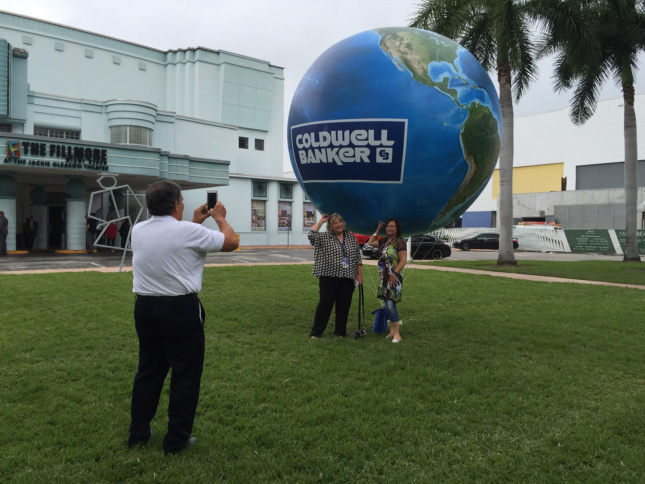 Miami Beach is the product of real estate development and a great deal of human effort. 100,000 residents (plus many visitors) live a precarious existence between the Atlantic Ocean and Biscayne Bay while the beaches are replenished by the truckload with sand from a mine inland near the south end of Lake Okeechobee. 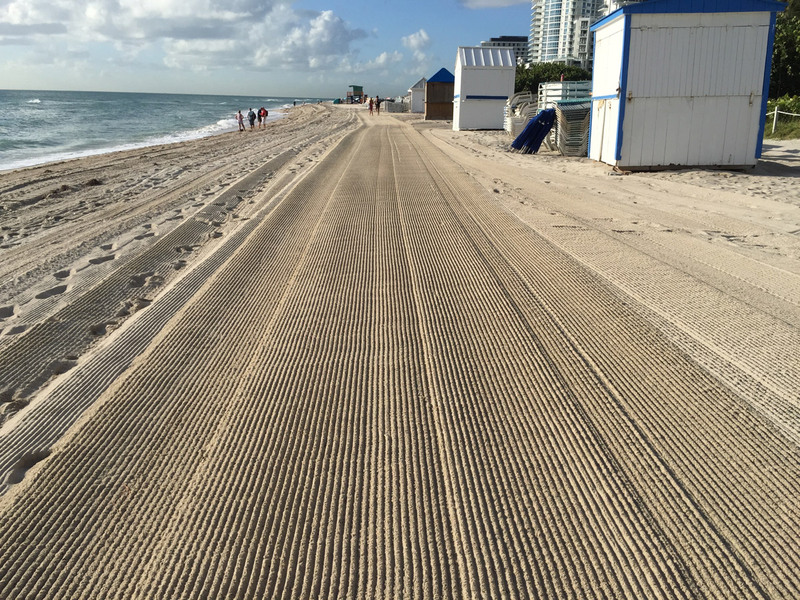 Miami Beach is out of sand, and with sea level rising a fraction of an inch each year, it’s running out of time. Chip Lord, best known to most architects as a member of the legendary experimental practice Ant Farm, has worked since the 1970s primarily as a video artist. Two of his recent projects, based in New York and Venice, have explored climate change. His most recent video piece titled Miami Beach Elegy” goes to Florida to explore a place that is already bearing the brunt of rising seas. Lord’s approach to this video grew out of a collaboration with Hayden Pedigo, a young musician who both plays guitar and composes ambient electronic music. Pedigo invited Lord to make a video based on his album Greetings from Amarillo, which the artist completed in 2016. Exploring the highways and outskirts of Amarillo, this is a 30-minute road movie that also explores the tourist attraction that Any Farm’s installation Cadillac Ranch” has become. Chip Lord decided to undertake another video portrait with Pedigo’s music, but instead of the Texas panhandle, he turned his camera on South Florida. This film contrasts day to day life in Miami Beach with the reality of flooding that is already occurring at high tides as water both overtops the existing shoreline defenses and seeps through the porous rock the city is built on from below. The film’s dialogue is limited to the opening sequence of a clip from a local newscast reporting on flooding caused by king tides, the highest tides of the year. Over a few minutes, the newscaster shows flooded streets and people wading through knee deep water but ends on a hopeful note that the city will soon be solving the flooding problem with pumps. He never mentions sea level rise or climate change. It’s presented as if it were a minor, one time inconvenience, not a preview of what’s to come. If the six feet of sea level rise that many experts are now predicting comes to be, pumping isn’t going to cut it on an island that is only four and a half feet above sea level. The pumps are a feature throughout the film. Lord uses the water bubbling out of the sewer outfalls, where the seawater is pumped into the bay, as a transition between segments. All of the while, Pedigo’s music fills the background with an atmospheric soundtrack that at times, in Lord’s words, resembles whale sounds. The film cuts between sections of riding in cars, parking in the Herzog & de Meuron–designed parking garage, walking with a handheld camera through a hotel, bulldozers dumping sand on the beach, and the “Beach Tech 2800” machine being towed behind a tractor grooming the sand for the next day’s visitors followed by an empty beach in the morning as employees put out chairs and umbrellas for another day. The mundane day to day tasks of setting the stage for the unending stream of tourists from around the world takes place in the early morning or under the cover of darkness. One of the more surreal moments involves visitors inspecting Damien Hirst’s Gone but not Forgotten, a gilded wooly mammoth skeleton inside a glass and gold vitrine that was exhibited at the Faena Forum, a facility that includes a hotel and a new art center by OMA. The mammoth is situated outdoors with swaying palm trees and the ocean in the background, its species a victim of both climate change and overhunting by early humans. I struggle to think of a more relevantly symbolic artwork one could place outside a beachfront hotel in Miami Beach. The camera lingers on tourists in the waves and a girl building a sand castle, which is slowly subsumed by the ocean. “3 Months Later” scrolls as the camera looks out the window of an airplane flying over Miami Beach as it lands. Then we see the architect of the Faena Forum discussing the project to an assembled crowd. The continued development of luxury Miami Beach real estate looks absurd in the face of feeble attempts to postpone the inevitable that Lord depicts in the film. There is already talk of “climate gentrification” as investors seek to buy inland property on higher ground in Miami proper, but in the meantime, people continue to flock to South Florida to buy real estate and look at contemporary art. While the beach umbrellas continue to go out every morning and the sand is groomed at night the water continues to rise.